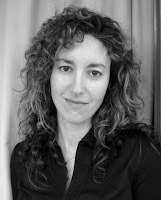 Hadara Bar-Nadav's recent publications appear or are forthcoming in Beloit Poetry Journal, Chelsea, Colorado Review, Denver Quarterly, Indiana Review, The Journal, TriQuarterly, Verse, and other journals. Her book of poems A Glass of Milk to Kiss Goodnight was chosen by Kim Addonizio as the winner of the MARGIE First Book Prize and is now available. Born in New York and former resident of Lincoln, she currently lives in Minnesota and is an Assistant Professor of English at St. John's University. Read sample poems at her website. Laura Sims's first book of poetry, Practice, Restraint, won the 2005 Fence Books Alberta Prize. She is also the author of the chapbooks Bank Book (Answer Tag, 2004), Paperback Book (3rd Bed, 2006), & Corrections (Bronze Skull, 2006). Her poems have appeared in First Intensity, 26, How2, 6X6, La Petite Zine, Columbia Poetry Review, jubilat, LIT, Boston Review, Indiana Review, & 3rd Bed & other journals. She lives in Madison, Wisconsin. Read sample poems here and here. Read interviews with Laura here and here. Michael Dumanis' first collection, entitled My Soviet Union, will be available at the reading Saturday. Dumanis holds an MFA from the University of Iowa and a PhD from the University of Houston. Currently an assistant professor of English at Nebraska Wesleyan University , he is coeditor of the anthology Legitimate Dangers: American Poets of the New Century (Sarabande, 2006).